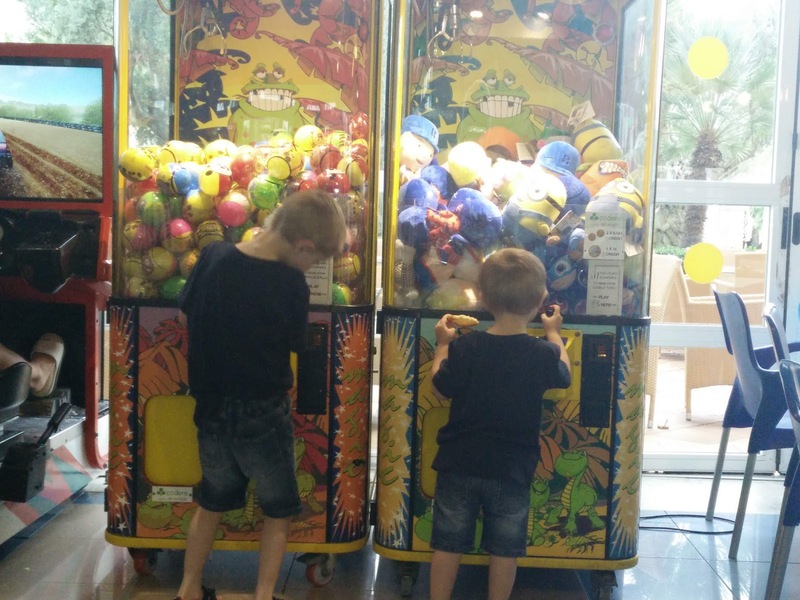 We all know that it can be hard to buy appropriate and enjoyable gifts for your children, and you might find yourself feeling more than a little anxious when it comes time for a birthday or Christmas or somesuch. 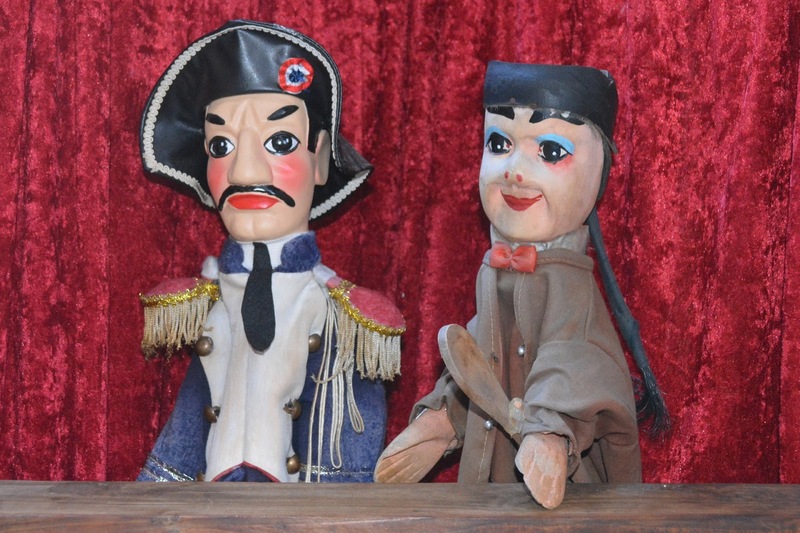 However, sometimes the best way to approach this is to go back in time and look at some particularly traditional gifts which might prove to still be enjoyable or surprisingly in vogue; and there are many of these to choose from if you do want to go down that route. In this article, we will take a look at just three classic gifts which you might want to consider buying for your daughter in particular - all of which are bound to bring a little joy into her young life. 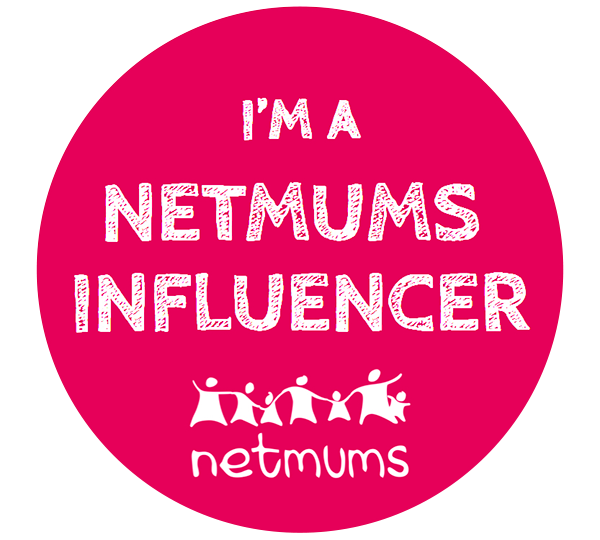 really appreciated, even if your daughter has never expressed an interest in such things before. with it too. The more complete a gift it is, the better it is likely to be received. If you think you would like to promote a particular passion for music in your daughter, then buying her a musical instrument of some kind or another is definitely a good way to go. Of course, there are some instruments which are better to buy a young girl than others, and one of the most popular here has to be the ukulele. Getting even a toy ukulele could be a great way to open the up into the world of music and spark a passion, so it’s worth considering. If you like, you could instead go for a keyboard or piano, so that they get started with that instead. This week has been about getting back into routine and normal life after our wonderful family holiday! It really does not seem like only last week we got home! This week James was invested into Beavers and he also gained his Global Issues and Creativity badges! He is absolutely loving Beavers and I am so glad I signed him up for it as it has done him the world of good to make new friends that do not go to his school! Last weekend we went shopping to get James a costume for the school halloween disco and also the halloween party at Beavers! 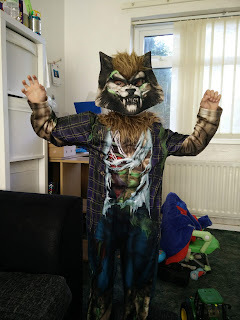 James knew he wanted to be a Werewolf so lucky for us Tesco were selling a werewolf costume this year! He knew he had to try it on when we got home!! Freddie has a great week! 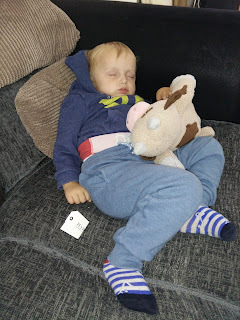 He loved being back at playgroup with all his little friends after our holiday! He was a bit sad when I dropped him off as he wanted to go get James as he was really missing him after him being by his side for the last ten days! Once James was home from school though, Freddie never left him alone and wanted to play with him constantly. 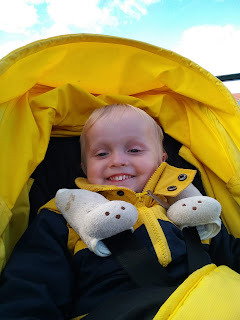 On Sunday we went for a walk down to Aldi as a family and poor Freddie fell asleep in the pushchair. 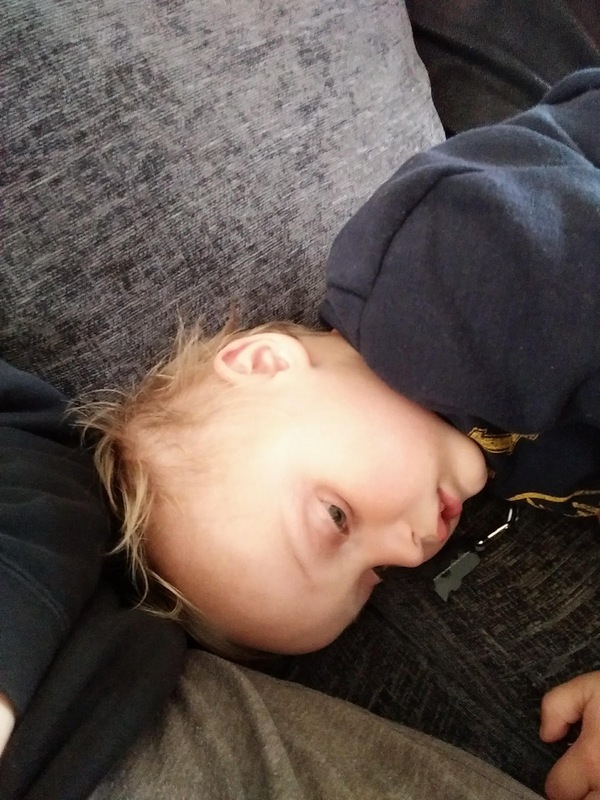 Once we got home we did have to eventually wake him up and this photo of him was after we woke him up and he just wanted to cuddle into mummy! 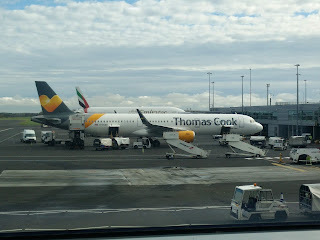 So we have just returned from a week in Alcudia, Majorca flying with Thomas Cook airlines from Newcastle to Palma. The flight over was brilliant. At 0525 our boarding gate was announced and it was straight down and onto the plane. We did have to sit for about twenty minutes due to some air traffic control restrictions, but once we were pushed back that was it straight to runway and off. The landing in Palma was very smooth and no sooner had we started the decent than we were on the ground. On landing though Freddie was a bit of a nightmare and he kept trying to climb out of his seatbelt to look out the window! On the way back Freddie sat in his seat while the other passengers got on but I did have to distract him with snacks to stop him messing around with the tray table. Once we were in the air though I managed to distract him with Hey Duggee and In the night garden on his tablet along with the very hungry caterpillar game he has! He wasn't that interested in his meal probably due to all the bear yoyo's and oat bars he had eaten before take off!! However Freddie did actually fall asleep on this flight! Although it was literally twenty minutes before we landed! 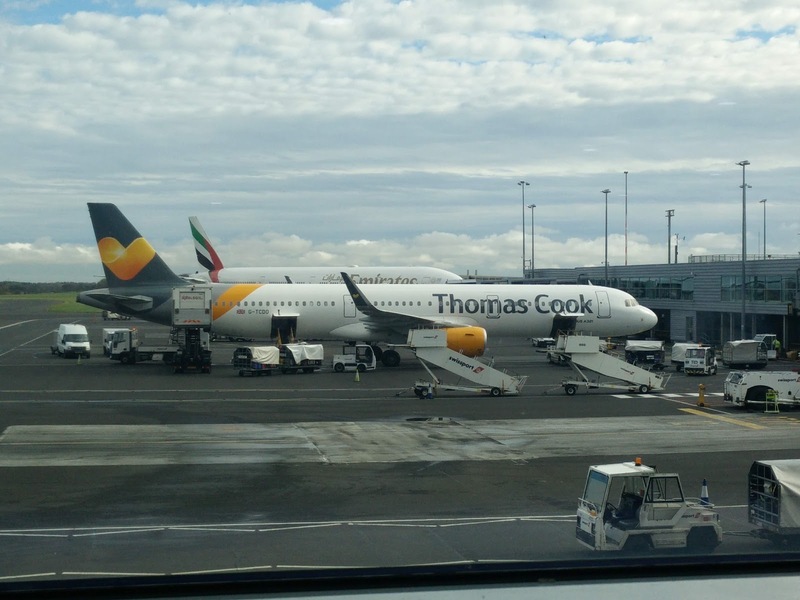 Would we fly with Thomas Cook Airlines again? Yes I think we would! Our plane back on the ground at Newcastle! 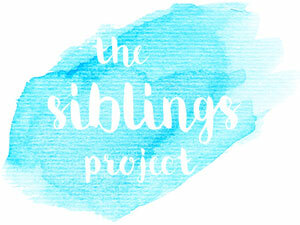 October and we have now completed 10 months of the Siblings Project 2018! 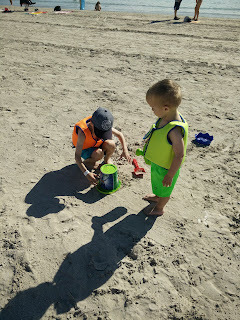 We have just returned from our first family holiday abroad and we had an absolutely wonderful week in Alcudia! This months photos were taken while we were away! 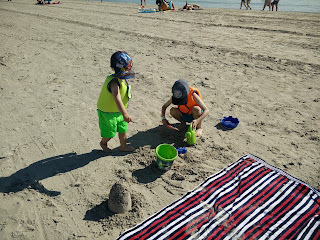 The boys loved spending so much time together! This week we have been on our first family holiday abroad to Alcudia in Majorca. The boys had an absolutely brilliant time! 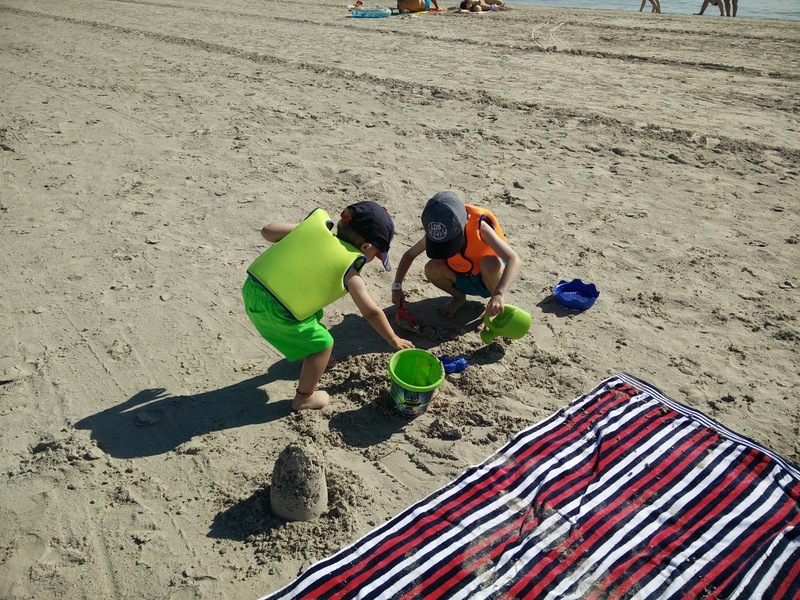 They both had a fantastic time playing in the pools at the hotel and also on Alcudia Beach! 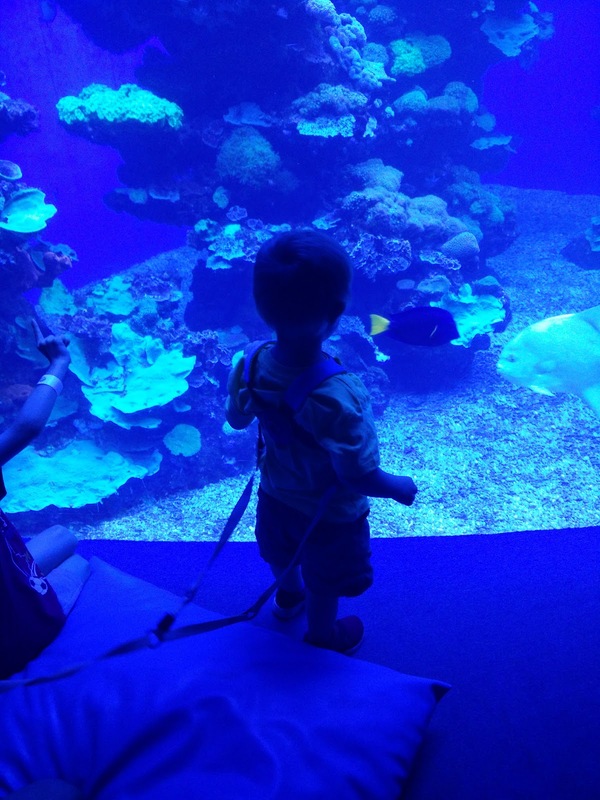 We had two days down at the beach and one day trip to Palma Aquarium. The rest of the time we either walked down to Alcudia Port and Beach to look around the shops or we were in one of the many hotel swimming pools! We also spent half a day at the Hidro Park which was next door to our hotel so we got free entrance as hotel guests! This weeks photos of the boys were taken at Palma Aquarium. 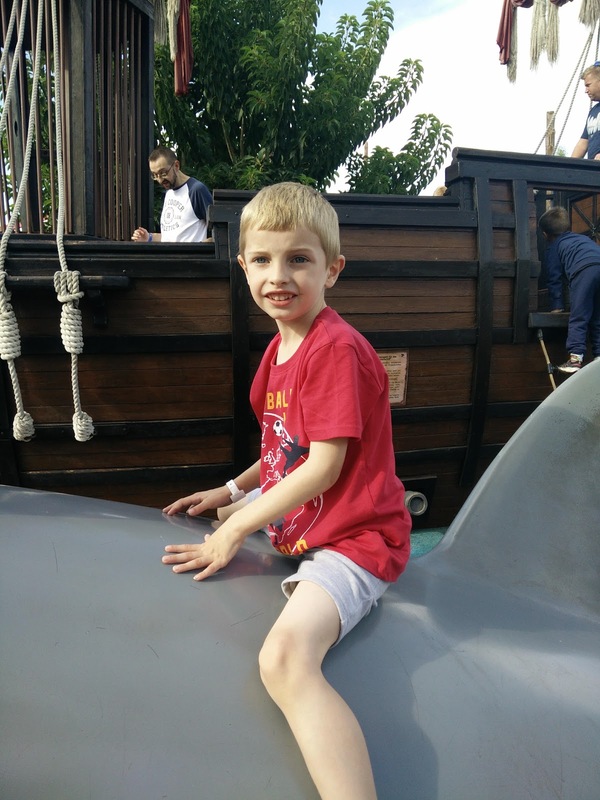 James loved climbing on the giant shark in the outdoor play area, where as Freddie was completely entranced by the fish in the big shark tank! For parents who have jobs, grown-up friends, and adult interests, it can be hard to step into the shoes of our children. But if we want them to get the most out of their lives, step into their boots we must. way to supercharge their development. 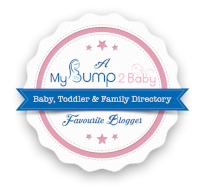 So what do you need to know as a parent? serve it up to friends (or teddy bears). concepts you could explore, from going to work to building a castle. 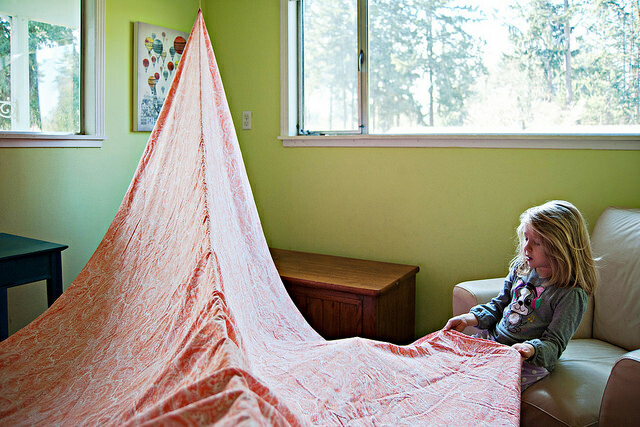 It doesn’t matter what your child builds: a fort, a rocket, a treehouse - they all engage the creative and spatial areas of the brain. So as a parent, it’s a good idea to provide the raw material they need. Although it might sound expensive, building things like forts and rockets can be very cheap, often using stuff you already have or were going to throw out. Old boxes, plastic bottles, cushions, and so on can get them started and making something exciting. You’ll often find that once you’ve provided the raw materials and prepared yourself for the mess, the kids will use their imagination and get on with things themselves. do it too in film, art, and music. 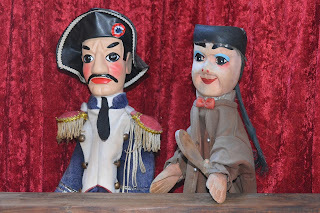 simple as a 5-minute puppet show or a quick sketch with a sibling. As a parent, you can also help get into the world of make-believe through role play. It's been another busy week getting ready for our holiday! James has had a great week at school and is getting so excited about our upcoming trip! On Saturday we went to a BBQ at James Beavers Scout Hut! The boys had a brilliant running around and James loved showing daddy and Freddie where he comes for Beavers. Mummy has actually already got Freddie's name down for Beavers! Freddie had a great week at playgroup again! He loves going for his two sessions a week! I am wondering how he is going to react in January when he goes in for more as once he turns three he gets his funded 15 hours. So we have decided for him to do one full day and three half days as a morning session and two afternoons! On Monday Freddie had actually got up for the day at 5am do he ended up crashing out on the sofa for an hour! 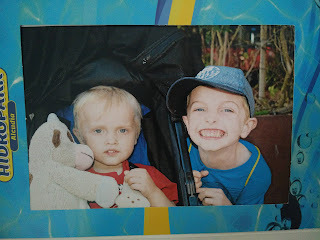 The boys have decided or should that be James has decided he wants to share a room with Freddie so once we are back from holiday we are going to start putting the plans into motion to redo James bedroom and make it into a room for both of them, starting with getting them bunk beds! 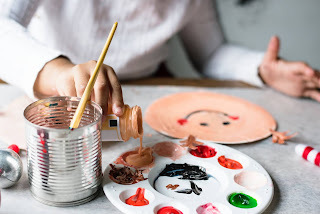 Children are naturally creative from a young age, and if you nurture that creativity as they grow it will get even better. Their imaginations are far superior to ours, and a recent study showed that this helps them to cope with pain and stress. Creativity can make them more confident, become socially adept and make learning easier. Find a space in your home for them to be creative. It does not need to be a large space or a special room. 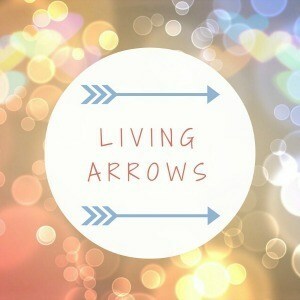 The corner of their bedroom or the living room could be ideal. Just make sure they have things they can be creative with. Dressing up clothes, a bag of Lego, plenty of crayons, pencils and paper are a good start. The important factor is that it is their space and they feel free to do whatever they want in it. It should be a simple area. It does not need to have a lot of expensive toys and gadgets. The coolest kids bedroom furniture; the kind of furniture that allows them to explore and imagine, such as beds that are pirate ships or which have slides to come down from in the morning, can make the difference between your child being creative or not. It gives them more to think about and they will enjoy creative play far more with it in place. It’s great them having the space they need but they also need the time to use it. Don’t organise every minute of their day. 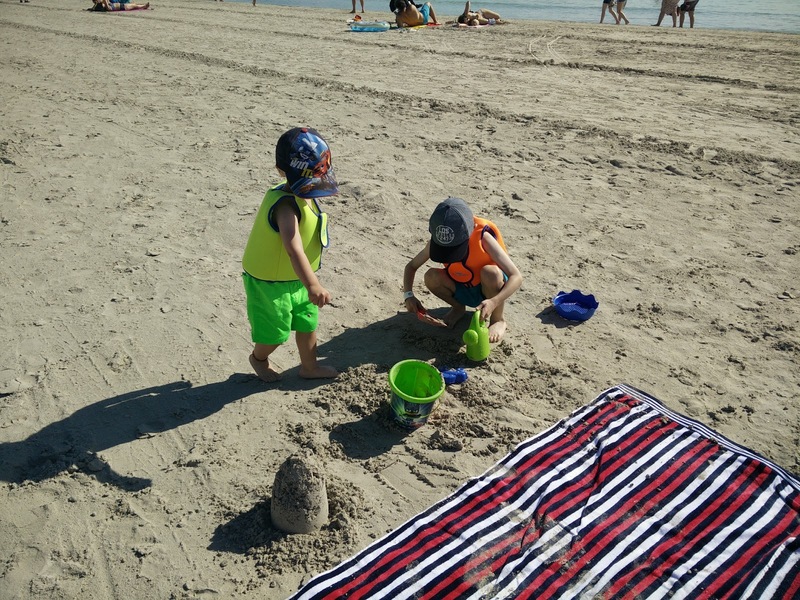 Let them have a few hours without scheduled activities so they can potter and do things at their own pace. Unless they ask for your help, leave them to do their own thing. Managing them takes away the need for them to be creative themselves. The best places to take your kids to activate their senses are places like art galleries, museums, libraries and outdoors. 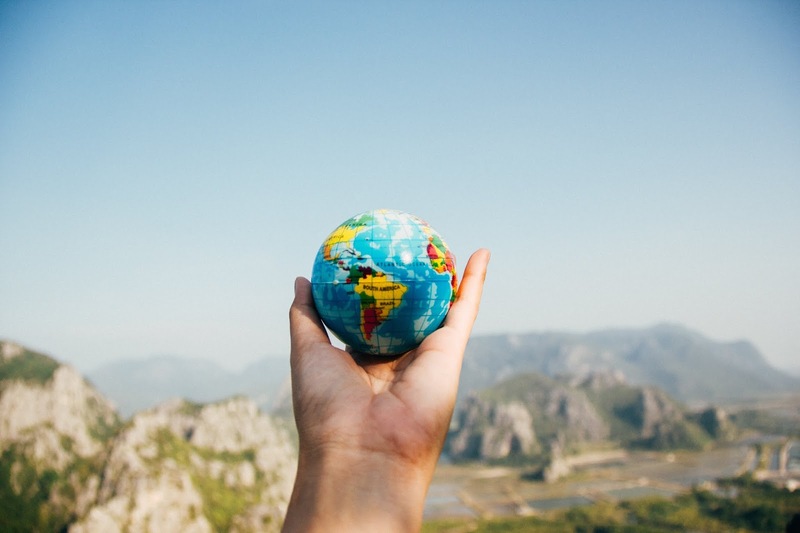 This does not mean that they should never go to theme parks and have fun, it is just that at some point they should visit these other places as well. Apart from encouraging their creativity, these sorts of venues can also be educational. If your child becomes interested in a particular subject, make sure they have the materials and activities to help them. A child interested in art, for example, you could buy an easel and varying sorts of paints for. If their love is motorcars, you could buy them books about them and let them watch some of the programs on TV or Youtube that are car related. Some children become interested in subjects that you may know very little about, and then they may need help from other people to be able to progress with them. Kids learn by example, and if you are creative your children are more likely to be. Join in with colouring and drawing from when they are young, you might actually find you enjoy it. Many parents do which is why there are so many adult colouring books available. If they want you to dress up with them, play the part they want. You may be surprised at the fun you have and certainly, it is a great bonding exercise for the whole family. Our Holiday is getting even closer and we cannot wait! Mummy and Daddy did the majority of the packing last weekend while James and Freddie went to spend some time with Nana and Gaga for the weekend. 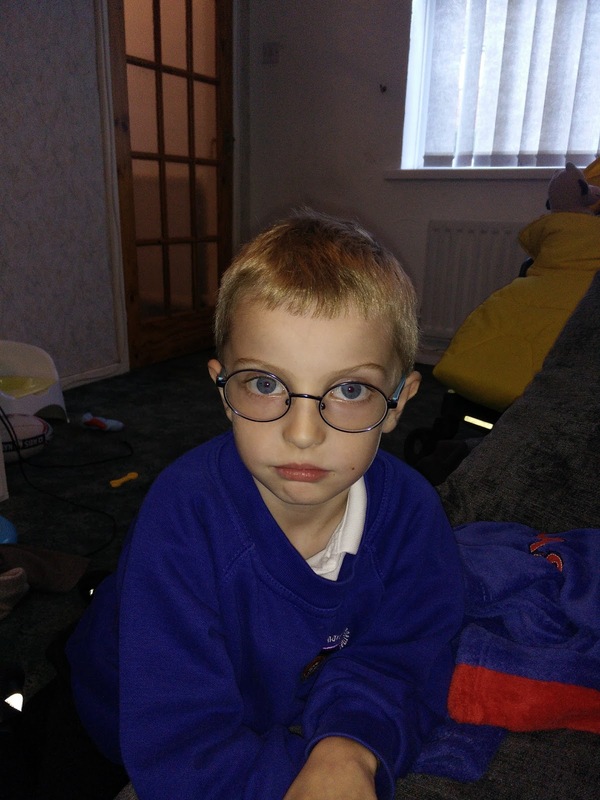 James is getting along with his glasses really well! So far we have only forgotten to take them to school once, So mummy had to run home and collect them and take them back to the Key Stage One door where James TA met me to take them up to his class room! James had his beavers meeting on Thursday night which he loves! I'm so glad he is enjoying Beavers as it is something for him to do outside of school and make friends that he does not go to school with! Freddie is still loving playgroup! He is such a good boy for them, although he is such a monkey at home! He has taken to pouring his water all over himself meaning he is going through at least two or sometimes three sets of clothes a day!! He also likes launching his dry cereal across the room so mummy and daddy are doing a lot of hoovering! Before we took James into school on Friday, we had to pop into playgroup for the photo day! 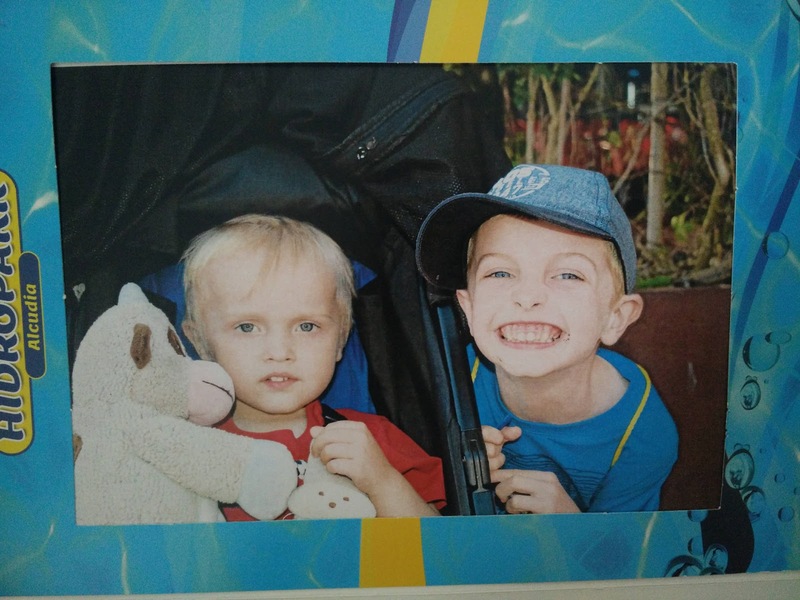 I took James with me to see if we could get a nice photo of the boys together! It was actually a no go as Freddie would not sit down! After mummy dropped James off at school on Friday she popped into the school hall for the Macmillan coffee morning. Although this year poor Freddie could not have any of the cakes due to his dairy intolerance. He was pretty grumpy about that! 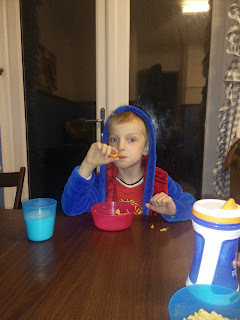 But mummy made sure she had some of his dairy free snacks with her!! Nana and Gaga came down in the afternoon and collected the boys before taking them up to their house for the weekend!